I just realized something about me recently.. I realize I’ve been so caught up in my everyday problems that I simply forget to stop and take a good look at my life right now. I mean..
Hey.. Life is good, actually. I’m healthy, I have a roof over my head, a stable job (however problematic it may seems).. A loving family, a beautiful city with clean air that I get to live in, a boss who is supportive, though sometimes gave me headaches.. 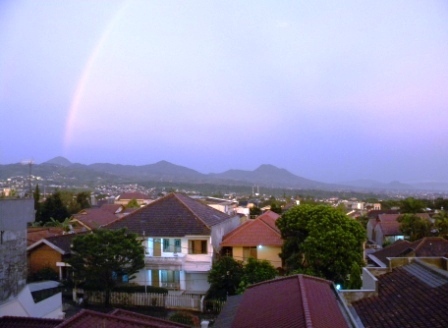 In fact this afternoon, I get to see a real rainbow..just outside my room. How about that! I even took a picture of it.. I looked at it and just wowed. Great isn’t it? It looks better in reality, mind my poor photo-taking technique. Anyway, I realized that this last few months I’ve been such a complainer. An egotistical one! I didn’t even realize I have that big of an ego. My ego it seems is SO BIG that I sweat and complaints on all the little stuff. Giving tantrum to all the people around me. The people I love got the most because they are around me most of the time. I even made Mom cry. I was such an idiot. And for what? If I stop and stare at my life in this instance. Masya Allah.. God has given me so much.. And I always wants more.. more respect, more service, more politeness, more support, more love, more sensitivity, more..more..more for my Ego. Hell, I want to live in my dream world where everything is PERFECT the way I want them to be. There’s no way that will happen. I forgot to just Be Grateful.. 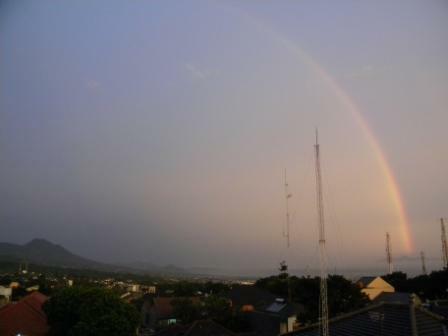 If I didn’t stop to take a look outside of my room window this afternoon, I wouldn’t have notice the rainbow soar beautifully to the blue sky. I wouldn’t have notice the gorgeous silhouette of mountains behind the sprawl of neighboring rooftops. 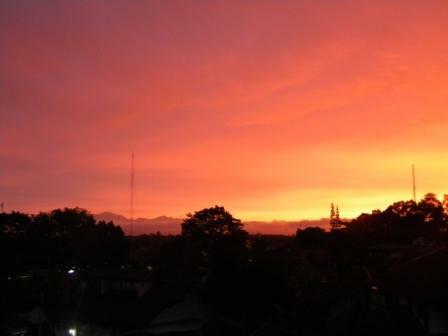 I forgot how beautiful the scenery from my room here in Bandung. I forgot..
Sunset at my window. Notice the mountain silhouette at the back? I forgot about all the little things that are beautiful, fulfilling, inspiring, enlightening that surrounded me. If only I focus my energy on those good stuffs instead of the bad, my life would’ve gotten even better. You know.. Life is Perfect just the way it is..
Because Allah is Perfect with His plans..
My prayer to GOD before I go to sleep tonight is for forgiveness. Forgiveness for me and for everyone I cared about and let down.. And may God open their hearts to also forgive me for my mistakes.. I pray to Him, let me be a person who never let the gleam and troubles of the world blind her from the blessings she received.. to always be grateful for all the good and the bad. To always be in His light and His Mercy.. Amen. To change I must first wholly accept the present moment. This moment, as it is, is perfect. Jadi ikutan merenung nih hehe.. Thank you Kakak.. Sering2 berkunjung yaa..